So I guess today we are only "24 Hours From Tulsa". ........but will he sing it ?........... has he sung it there before ? The lucky ones going to the gig can let us know. Goon Squad wrote: has he sung it there before ? The venue is Cain's Ballroom. He's played "Blame It On Cain" at three out of four previous appearances there. So this could be the time ! "I Lost You" was written "On The Road To Cain's Ballroom, Tulsa – 2009"
I reckon he'll stick in a few lines of 24 hours from Tulsa in Accidents will happen. Cain's Ballroom in 2009 was the be the last stop on my proposed Southern UD road trip , only to be thwarted by b******s in UHB ! Cain's Ballroom in 2009 was the be the last stop on my proposed Southern US road trip , only to be thwarted by b******s in UHB ! This show is incredible. Elvis sounds better than ever. Such a crazy experience to see him all by himself on this stage. Elvis then told a story that he said Steve didn't even know about. He had written Accidents and had fallen in love with "quite an attractive taxi driver" in Tucson, Arizona and had asked her to take him to Mexico before deciding about 10 minutes later to turn back. 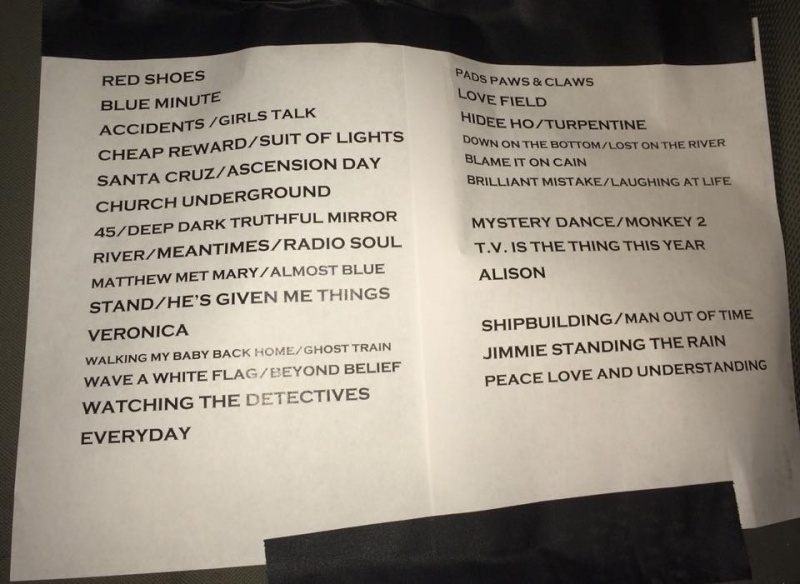 Thanks to Charles and Eric for the setlist. 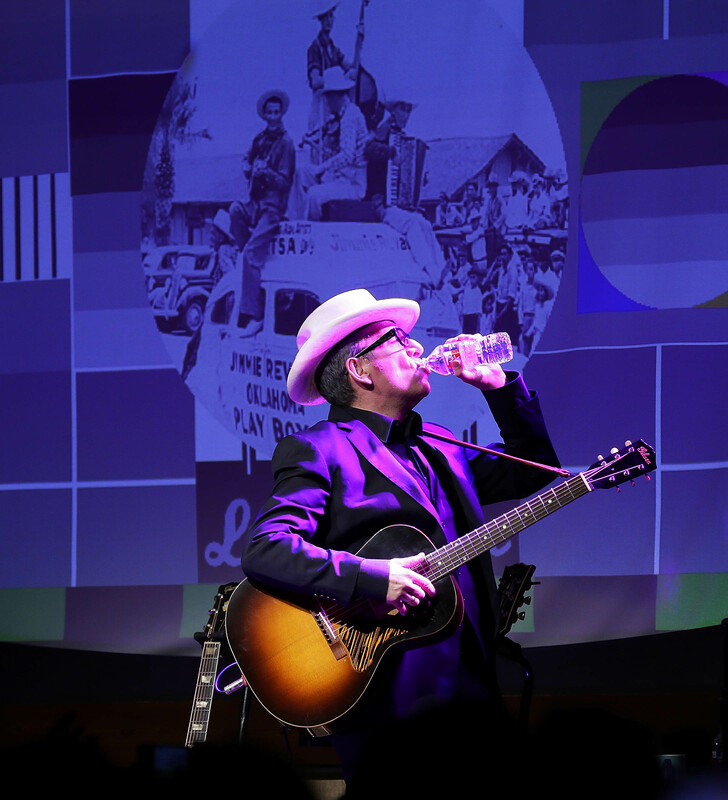 When Elvis Costello takes a stage, his energy, passion and distinct voice snap the room's attention. When he takes the stage solo, it's a mesmerizing two hours of music spanning his long and storied career. His show Friday night at Cain's Ballroom was just that: An attention-grabbing set of music that was like a tribute to that career, with the man himself alone on stage, taking us along for an incredible ride. Costello's voice is and has always been strong and distinct. His raspy, punk yell is a hallmark of his music. But live and in person, especially solo when the spotlight is squarely on his characteristic white hat, glasses and black suit, it transcends music to become an experience. The show got off to a great (and early!) start when the sister duo Larkin Poe. With Rebecca Lovell on mostly acoustic instruments and vocals and Megan Lovell on electric lapsteel and harmonies, it was a stripped down rootsy sound that made the most of the combination of acoustic and electric to great results. A little more on them later. It was a bit odd to see Costello on stage completely alone. He's played with bands and groups for much of his career, and then he owned the stage. Solo, the stage truly is his. However, he wasn't really alone. The sold-out Cain's Ballroom crowd would give him sufficient backing vocals throughout the night, starting with "(The Angels Wanna Hear My) Red Shoes." For about the first hour, Costello was solely acoustic, even playing a few songs unplugged with only a single microphone, the guitar held up to get the whole sound in one place. And there is so much sound. Costello's voice is unmatched and his guitar work is captivating. The voice is as strong as ever, hitting his signature tone singing softly or with a yell, high or low on his range. It's a voice I can imagine was not far off from the one those first lucky fans heard echo in Cain's Ballroom in the late 1970s. "Every night, I try to think of a theme," Costello said. "I was going to sing songs of love and fidelity, and it was going to be a short show. And I remembered we were going to be at Cain's Ballroom." Cut the applause and foot-stomping, putting that old Cain's Ballroom floor to good use. With his solo approach and the setup of the stage, many times throughout the night it felt as if we were in a small listening room or his studio. A large set television projected images of a few famous folks, including one of Bob Wills. That was incredibly fitting to recognize the man who built Cain's on his 110th birthday, recognized by another one of Cain's favorite sons in Costello. After about 50 minutes acoustic, he plugged in for "Watching the Detectives" and turned it into a raucous reggae rock show. But not for long, because he sat down next at the piano and took us to church with the gospel- and soul-infused "Can't Stand Up for Falling Down." The show spanned his career, and the switch between these acoustic versions to electric rock to a soulful piano solo showed his range of style all in one flash of time on stage. He put a smile on my face the moment he took the stage, and this made it spread even wider. As much as he's feeling the music, it's hard not to catch his optimism and joy yourself. Larkin Poe returned to the stage later for several songs with Costello, and the sound level and complexity exploded. Ending the night with Larkin Poe singing "(What's So Funny 'Bout) Peace, Love and Understanding," was a great send-off, the crowd stomping and singing along like they had all night, now with vigor. If you love your job, it's not really work. If that's true, Costello hasn't worked a day in 40 years, and he definitely wasn't working Friday. It looked so effortless yet sounded so polished and strong, Costello was performing with conviction. He said as he left the stage that he would see us next time. We're counting on it. verbal gymnastics wrote: I reckon he'll stick in a few lines of 24 hours from Tulsa in Accidents will happen. And No Coffee Table wrote: Thanks to Charles and Eric for the setlist. On a bit of a roll at the moment.